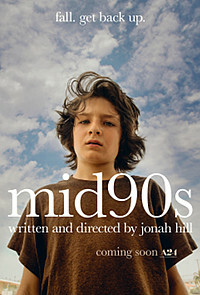 Warm and engaging, this coming-of-age drama is a nice slice of life, written and directed by Jonah Hill with a lively edge. It's a very boyish movie, following its young teen protagonist as he discovers a world of machismo and masculine posturing. The film's pacing is somewhat meandering, as it wanders between significant moments in a way that feels over-familiar. But it's earthy and involving. In Los Angeles, 13-year-old Stevie (Suljic) hasn't had his growth spurt yet, struggling find balance between his needy single mother Dabney (Waterston) and thuggish big brother Ian (Hedges). Unable to fit in, he's drawn to a group of skateboarders (including Smith, Prenatt, Galicia and McLaughlin). As he hangs out with them, he begins to feel for the first time that perhaps he belongs somewhere. They introduce him to smoking and alcohol and a bit of sexual initiation with the girls. And they stand up to Ian in ways that make Stevie stop and think. The film has an almost documentary tone, with observational cinematography by Christopher Blauvelt that catches personality details and a strong sense of movement. These teens think that talking tough, disrespecting women and indulging in forbidden behaviour is what makes them cool. They push each other to do dangerous stunts. And they're are starting to understand the realities that they may need to take a deadend job just to get by. Performances are subtle and realistic, as Suljic and Hedges add layers of sensitivity under their bravado. It's fascinating to see how the dynamic between brothers shifts as Stevie develops a sense of his own power. Ian may be bigger right now, but Stevie is clearly not going to put up with his cruelty much longer. And the scene where Stevie snaps at his mother is staggering. While she's on the edge of the film, Waterston has terrific presence. And Smith has fierce charisma, a young actor to keep an eye on. The film isn't so much an exploration of 1990s culture as it is a nostalgic look at the perspective of a young teen trying to make sense of a world that seems endlessly confusing and harsh. Even with its more extreme elements, the film is never quite as transgressive as it thinks it is, but then neither is Stevie. As a writer-director, Hill has a superb eye for character, and he wisely avoids making it clear that Stevie is going to be all right when he grows up.